A rendering of Waterside’s plans prepared by christopher consultants. The developers of Waterside, a massive mixed-use community along Rt. 28, withdrew a request for 305 additional apartments on top of the 2,595 residential units that had been previously approved, winning their latest application a speedy approval May 9. The developers requested to rezone 2.2 acres the owner acquired in a land swap with neighboring planned research development park Dulles East. The application faced opposition among county planners and the Board of Supervisors for its request for permission to build hundreds more homes, even though construction had not yet begun on the 335-acre mixed-use development. The developer first requested 405 apartments, a number that was scaled down to 305 by the time it got to the Board of Supervisors. That, too, was met with skepticism at the board, which planned to send the application to committee. But ultimately the developer decided to withdraw the request for any additional residential, winning them approval by an 8-0-1 vote. “We heard loud and clear from several of you up on the dais that you were not happy with the residential that we had proposed here,” said urban planner Molly Novotny of the law firm Cooley LLP. The ultimate plan for the site would see the Chantilly Crushed Stone quarry filled with water after its last contract—with the last leg of Silver Line construction—is up. The property would then start converting to a waterfront mixed-use development with 2,200 multi-family residential units, 395 age-restricted units, and 3.8 million square feet of non-residential space, along with an automotive service station, a fire and rescue station, and two schools. 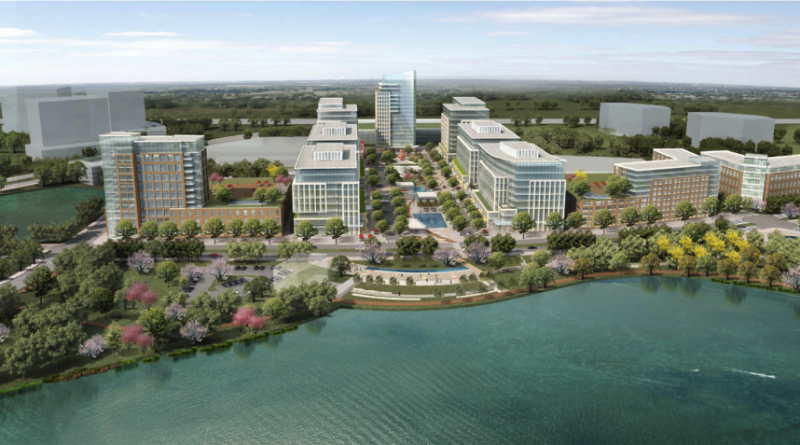 Waterside’s plans would make it one of the biggest planned developments in Loudoun, more than double the number of homes approved at One Loudoun.